Located among the Santa Rita Hills vineyards, it is an easy drive, eight miles west of Highway 101 from Buellton along Highway 246. You can take Campbell Rd. and travel approximately 2 miles to Chaotic Exotics. 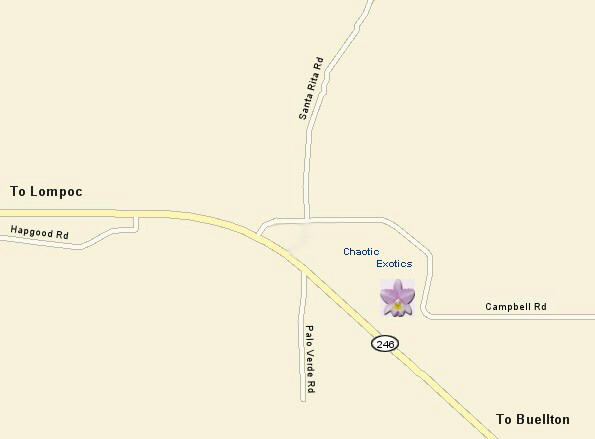 From Lompoc, we are located 6 miles east on Highway 246 and you turn left onto Campbell Rd. and travel approximately 2 miles to Chaotic Exotics. Our nursery is well identified with signs from both if you are traveling from either direction on Campbell Road. Once you arrive just take the driveway past the house, the guest quarters, the garage, and a small greenhouse on the left, through the white fenced gate....and you are there! When you are done visiting Chaotic Exotics you might want to travel to Lompoc to see the wonderful murals, the Lompoc Valley Flower fields, our local vineyards and their great tasting rooms, La Purisima golf course, La Purisima Mission, and Vandenberg Air Force Base. If you are traveling back to Highway 101 and Buellton, you might want to visit Pea Soup Anderson's, Ostrich Land, the Flying "V" Llama Ranch, or go a little further east to Solvang, Danish Capital of America, Santa Ines Mission, and the Chumash Casino. No matter which direction you go from Chaotic Exotics...it all spells FUN! If you are using a DIAL-UP connection, then please navigate the site with the links below. These links are less graphic intensive.